Daily Illuminator: Someone Else Warped By Toon?! February 23, 2013: Someone Else Warped By Toon?! The Gameological Society website recently had a feature that asked, "Have you ever played a game that felt like it was made just for you?" 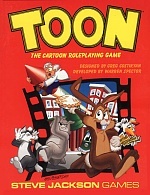 One of the games mentioned was Toon: The Cartoon Roleplaying Game. Anyway, if that sparks nostalgia for anyone else as it did in me, why not swing by e23 and pick up this classic? All you need to supply are your own dice and banana-cream pies!